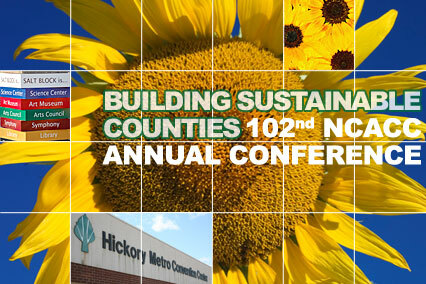 The NC Association of County Commissioners (NCACC) held their annual conference in Hickory this past Thursday through Saturday. Many folks from the School were involved in attending and presenting programs at this year’s conference. Norma Houston and Fleming Bell offered a pre-conference workshop on ethics for county and municipal officials as part of our Local Elected Leaders Academy. Bill Rivenbark offered a workshop on embracing financial sustainability and Jonathan Morgan did one on homegrown approaches to creating sustainable local economies. Jeff Hughes and Richard Whisnant offered a session on county leadership and water sustainability. State Treasurer Janet Cowell was the general session speaker on Saturday morning, and she repeatedly emphasized the importance of the School’s work with counties. She mentioned the online financial dashboard that we have developed and are partnering with her office to make available to local governments—it is the result of innovative work by Greg Allison, Bill Rivenbark, and Dale Roenigk. As I made the rounds and talked with county officials, I heard many positive comments about our conference workshops and about our day-to-day work with counties. The highlight of the conference for me was on Saturday morning, when the NCACC honored David Lawrence by giving him their Distinguished Service Award. The award was established in 1970 and it has only been awarded 12 times in 39 years. NCACC President Mary Accor (Cleveland County) did a wonderful job in describing David’s contributions to counties over the years, and David was gracious and funny in accepting the award (wearing a suit and tie!). Congratulations to David on this well-deserved honor, and thanks to everyone who was involved in developing and offering our programs at the conference.